They are delicious right now, I have been buying 10 boxes at a time! So, I have been following Weight Watchers for 3 weeks, and have had great success. Down 9 pounds, and haven't missed a thing. Some days I add my wine right into my points at breakfast so I know I can have a glass or two! But I haven't been cooking a lot, a turkey burger and sweet potato, lots of salads, smoothies and even some home made pizza. But really not a lot that I felt was worthy to share. But since I gave up chocolate for Lent, I have been hankering for a little dessert. So, I decided to make one of my favorite spring dishes, and lighten it up. So here is the original recipe, which is fantastic. It looks like I cut it out of a Bon Appetit, and it has been at least 5 years. Preheat to 350F. Butter a 9" pie dish. Chop almonds, graham crumbs and sugar until finely ground. Add the melted butter and press moistened mixture into pie dish and up the sides. Bake until set, about 12 minutes. Cool completely. 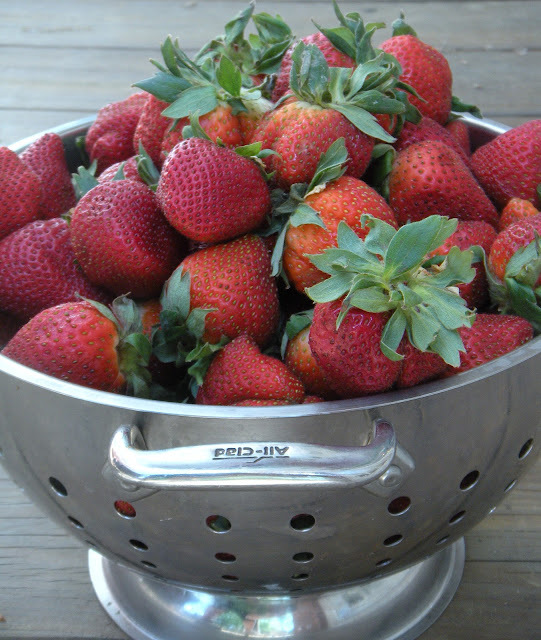 Place 2 cups of berries in saucepan and mash while cooking on medium heat. Add sugar, cornstarch and lemon juice. Stir until sugar dissolves and mixture thickens, boiling gently. About 3 minutes. Transfer to a bowl and cool to room temperature. Add the remaining berries and the zest. Mound filling in crust and chill until set, which could take up to 6 hours. So by the WW calculator, it has 83 total Points+, and 14 points per serving. Granted it serves 6, and I usually cut a pie into 8 pieces. But either way, it can easily be lightened by cutting down on the almonds, the sugar and the butter. And I have to say right up front, I don't use any artificial sweeteners, even Truvia. I just don't care for them. I think we are used to things oversweetened anyway. The butter is a bit of a challenge, I use tons of real, unsalted butter for my cookies. But I thought maybe there was a healthier alternative, and after perusing nutrition info, I think no. So I am just going to slash that too. Here's how it went. I put individual points plus to the side, the recipe builder makes it's own calculations so it doesn't always add up exactly. A little whipped cream and we are ready for dessert! I put the grahams in my blender and ground them fine with the almond meal and sugar. In a bowl, mix the crumbs and butter and press into a pie dish that is sprayed with nonstick spray. Bake at 350F, I could smell mine at 6 minutes and I took it out. My pie dish is 10" so more pieces, less points! Mash them with a pastry blender. Cook 3 cups of the berries over low heat with the sugar, cornstarch and lemon juice. It will thicken pretty quick. Remove from heat and cool to room temp. Mix with the rest of the berries and zest and mound into pie shell. Chill until set. Or until you can't wait any longer! As you can see I bumped up the berries since my pie was bigger, and I could have bumped them up to 7 cups. The thickened berries were plenty thick and I can't imagine why you want a full 1/4 cup of corn starch. I think my mixture was too hot when I added it, so it is a little cloudy and thick, but when I mixed it with all the other berries it is fine. I will take a photo when we eat it! In the recipe builder, it equals 39 points+. So 6 points a serving for 6 servings or 5 points a serving for 8 servings. Of course a dollop of Cool Whip Light will only set you back a point or 3 pts for the real whipped cream. So, what are you waiting for? Get in there and cook! What? You don't know what I am speaking of (I'm talking to my mom here...) Pinterest is the hottest thing going right now. Way better than surfing blogs, it is all visual, pin the food, drink, craft, clothes, bird, quote, whatever, to your virtual bulletin board and it is there for you to find. No scrolling through bookmarks and files. Photos make it so easy. But I was a skeptic. Would I really come back to this? YES! You have to be invited, but that is no big deal, the more the merrier, I am happy to invite you if you need. Then you start scrolling through the photos. When something catches your attention, you pin it. There are boards already named, and you can name your own. I am there as Sweetie Petitti, so come find me and we can follow each other. You want to follow your friends, and avid pincers to find the hot stuff! But here's the best part. The ideas I have found, used, created. Really. I have a pair of those gargantuan washer and dryer, front load. The bases available were too big, so I just left them as is, but they really are low to the ground. Then I saw this, a post off a blog, pinned, and it includes all the directions to make a base. We had to modify it a little, but this amazing woman has plans, shopping list, lumber cut list and all the directions. 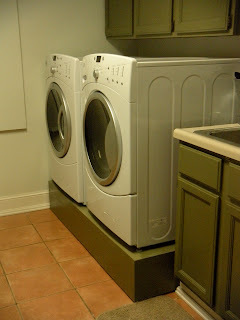 I think mine look pretty darn good, and do I love having my washer and dryer at eye level! But a word to the wise, a front load washer is REALLY HEAVY! Okay, I didn't make them, I was the supervisor. And then there's the grated cheese. Yes, I am a foodie, but not everyone in my family feels passionate about things like I do. So yes, I do buy wedges of parmesan, romano etc. But I do buy Kraft grated cheese with the green lid. My hubby loves the stuff. So when I saw this, I was like...yea. So now I buy a nicer grated cheese and put it in the jar. She is a very clever girl that discovered this, and I doubt I would have ever stumbled upon her blog. I do realize however, how many pooh, poohs I am going to get over grated cheese. Get in line, I'm Italian, my family has made it clear already that this is a travesty. I made these yummy chicken thighs for dinner. A food blogger I don't know (there are millions...) posted it, and I happened to have a package of thighs in the fridge and 3 ingredients. Although I chose agave nectar instead of maple syrup, French Dijon that is so hot I can't eat it on a sandwich (perfect here), and rice wine vinegar. I have done thighs twice, breasts and even salmon. They were delicious. And let's not forget breakfast. These oats are actually soaked overnight in the Greek yogurt with Chia seeds, and then I added fruit. I am on a diet, and as delicious as it is, with a cup of coffee it was 9 points. That is a huge breakfast for me. I think I will stick to a little Kashi Go Lean in my yogurt with fruit, I do kind of like the crunch. And also, all these photos on Pinterest of food in jars...do you eat cereal out of a jar? Just asking. I made this healthy tuna sandwich which I did not take a photo of, but I really liked it. No mayo, and the Greek yogurt made it tangy. My coworker thought it was awful, but I am sold. I have also had layered taco dip in individual plastic cups at Bunco...Pinterest. White Castle Sliders...Pinterest. Tons of quotes pop up on peoples status on Facebook...Pinterest. Amazing cookie, cupcake and birthday ideas are overflowing on Pinterest. And oh my gosh, if there was a wedding, you would be overwhelmed with ideas. It's like a community of friends sharing ideas. Currently I am looking for headboard ideas, outdoor living ideas and always looking for a great recipe. So come on and join the fun. Happy Pinning! Be A Good Cookie Give Away! 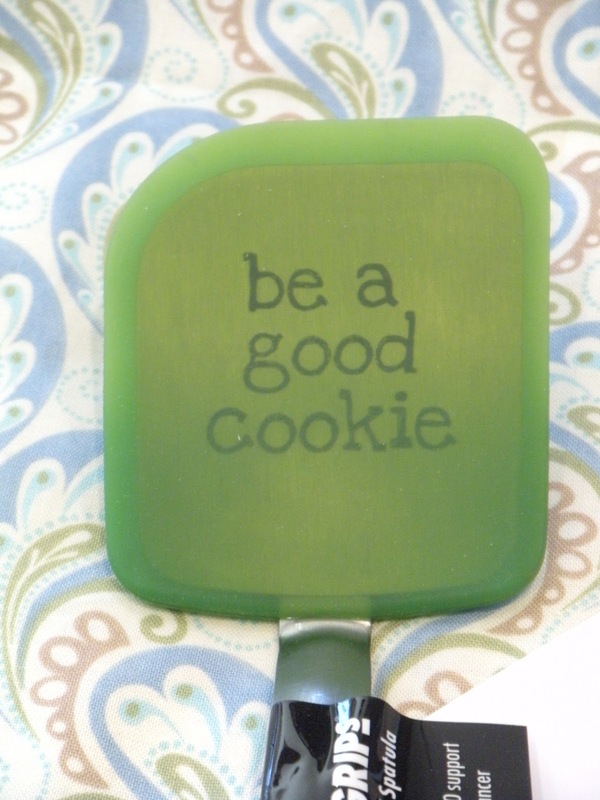 A Great Cookie Spatula for you! Congratulations to Heather fron It's Yummy To My Tummy for winning! Heather found me through the Secret Recipe Club! Stay tuned. I am redoing my sewing room and am SOOOO inspired to sew up a storm. Thanks again to you all! Well, here it is, my very first give away! 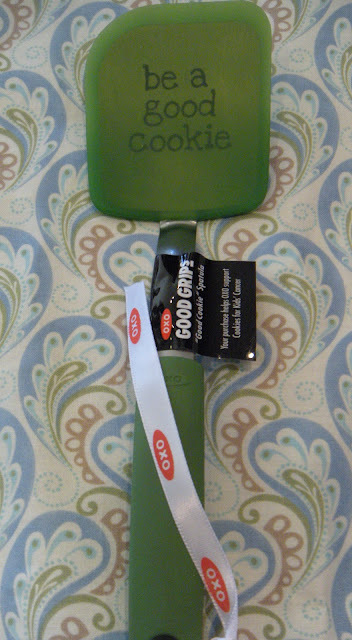 I was chosen by OXO to help bake a difference, and they sent me 2 of this cute cookie spatula. One for me to give to you, and one for me to keep. By baking cookies and holding bake sales, OXO has helped raise over $150,000 to support Cookies For Kids' Cancer for childhood cancer. This spatula is available in limited quantities at Bed Bath and Beyond, and part of the proceeds go to their campaign. OXO is a great company, less than 70 employees, and they have a presence in most American kitchens. Their kitchen gadgets are made to be functional, comfortable and affordable. Disclaimer: Yes, we sell many OXO products at WS, I am not doing this because of that affiliation. My blog was chosen by OXO. I am in no way, any kind of decision maker for WS. I am a worker bee. An OXO spatula and a Butcher's Apron (that this baker loves), made by me! 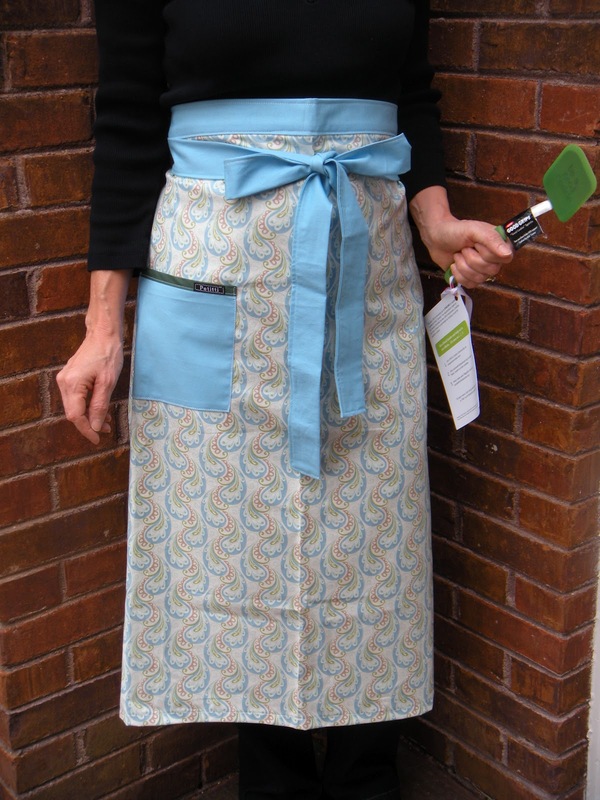 And because I wear many hats, I decided that I would add an apron to the give away, made by me. I love a good apron, and I love to sew. I made it out of a book called A is for Apron. I go for the butcher style because I sit and decorate cookies and my lap and legs are covered, and thus my apron is covered in icing! And this is truly special because it has the Petitti label right on it! It's long, but it is one of my favorites, here's hoping you agree! Be a Good Cookie Indeed! This month, I was assigned Culinary Adventures With Camilla for my Secret Recipe Club assignment. Digging around someone's blog is really quite fun. I find when I am poking around on my own, I am often lured to other links. But for SRC, I have to focus on the author, their culinary perspective and find the perfect recipe. This was no easy feat! Camilla is the most prolific blogger I have ever read. Honest. You figure an average of 30 days in a month, but she has months she posts over 50 times! And we're not talking about mac and cheese here. She really does take you on a culinary adventure! She highlights different countries and cuisines and involves her kids and husband into the adventure. There were times I had to go back and see if she was actually in another country! I think she is in California which means she has a lot more ingredients on hand than I do in Tennessee, but where does she find the time!? I bookmarked Italian recipes, a couple of rhubarb recipes (I have a bag from my sisters farm crystallizing in my freezer), and a few grilled ideas. But when I came across the Irish Car Bomb Cupcakes, well I decided these would be pretty fun for St. Pat's. She actually made mini bunts, but I will be heading off to visit my kids at college, and I think they might enjoy these as mini cupcakes! 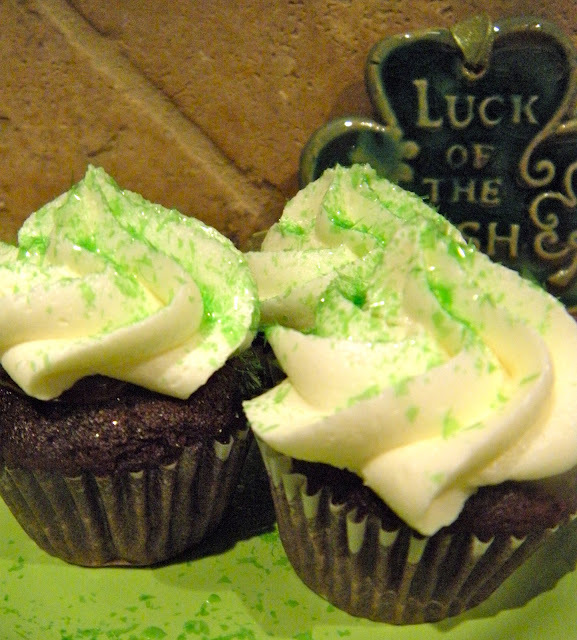 I mean let's be honest here, they're chocolate cupcakes made with stout, filling made with Bailey's and Irish Whiskey in the frosting. What's not to love!? I bought this little 4 pack, but not mini bottles of Bailey's, and totally enjoyed the remainder in a glass. I forgot how good it is! Is 10 a.m. too early for this? Could it be 5 o'clock in Ireland by any chance? Also, like Camilla I didn't have Irish Whiskey in the cabinet, so I went "local" and used Gentleman Jack. 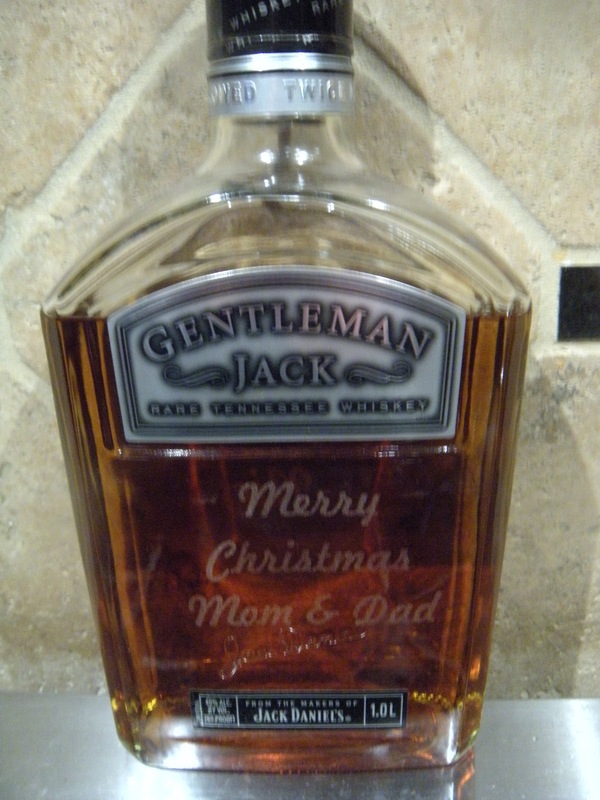 I mean it's made in Tennessee, and we should support our local industries, right?! Bring the cream to a simmer, remove from heat, add the chocolate, butter, and Bailey's. Let sit for 3 minutes. Whisk till the chocolate is completely melted. Cool, I am not patient here, and I proceeded with it fairly runny. Camilla filled her cupcakes after pulling a plug of cake out. I opted to cover the top in ganache. That way there is a chocolatey hit on every bite, plus the minis are pretty little for a filling. Chill to firm ganache.